Follow in the footsteps of St Patrick this weekend… or at least to the places he’s reputed to have visited for special events. LOOKING FOR A peaceful hideaway to escape St Patrick’s Day? Or perhaps a serene oasis to soothe your hangover on the 18th? Here are some of the wonderful heritage sites that are linked with St Patrick. Firstly I have to admit that although Patrick is closely associated with places all over Ireland, much of this is probably the result of later invention by clerics who wanted the important saint attached to their site. Pilgrimage was big business in early medieval and medieval Ireland, and if you had a relic or site associated with a famous saint then you were guaranteed a hefty income, until the Reformation came along in the sixteenth century and did away with much of that idolatry. Party poopers. In fact in the two accounts written by Patrick himself, he only mentions one place in Ireland – a place called Silva Focluti which historians believe was somewhere in County Mayo. Many of the places that we now associate so closely with Patrick may not necessarily have been visited by the man himself, but that isn’t to say that they are not beautiful and atmospheric places to visit today. So why not escape a little of the Paddywhackery this weekend? There are many sites associated with Patrick such as Armagh or Downpatrick where he is reputed to be buried. Here are just four of the many sites that are closely tied to Ireland’s patron saint. The Hill of Slane is part of the highly mythologised legends that grew around St Patrick constructed by later writers. As part of his mission to convert the Irish, legend states that Patrick chose to attack and subvert one of the most important Pagan traditions – the lighting of the Bealtaine fire. Bealtaine marked the beginning of summer, all the fires across the country would be extinguished to mark the end of the winter, and a great fire that could be seen for miles around would then be lit at dawn on the Hill of Tara, symbolising the dawn of a new year. Patrick sought to hijack this pagan practice. He lit a huge fire on the Hill of Slane. The fire burned throughout the night before the King’s warriors managed to capture Patrick and haul him back to Tara to answer to the King. Legend has it that Patrick then managed to perform many feats and miracles to prove to the King that the Christian God was far more powerful than the old Gods, and he used a three-leaved shamrock to explain the mysteries of Christianity to the King. While the King had no wish to convert to Christianity himself, he was convinced enough to allow Patrick to continue on his mission to spread Christianity across Ireland. It is likely that Patrick never actually visited Slane, but because Christian monks and scribes were generally the only literate people at the time, we only have their version of the story. However we do know that the site was important to the early Irish church, as a monastery was founded on the hill by St Erc who died around 514AD. This monastery is mentioned a number of times in the Annals of Ireland as being an important centre of early Irish law. Viking raids are also mentioned , most notably in 948AD when it is recorded that the ‘abbot of Slane was taken prisoner and died in pagan hands’, and two years later in 950AD when the bell tower of Slane was burned. Though nothing remains above ground of the early medieval monastery, today visitors to the Hill of Slane can find a superbly preserved 16th Century Franciscan Church and College. These remains are a wonderful place to explore. Both the church and college are thought to date to 1512 when Sir Christopher Fleming, Baron of Slane, founded the site for the Franciscan order. The Hill of Slane is a great place to visit. The site is free to enter and has a large car park. However please make sure that you take care (especially with small children) inside the ruins of the college, as the staircases may become dangerous in wet weather. There are a number of other great sites to see nearby such as the Hill of Tara. The Hill of Slane is well signposted from Slane, just head north up the hill on the N2 through Slane and take a left turn at Chapel Street. St Patrick’s Well is situated in a tranquil valley to the west of Clonmel, close to the village of Marlfield in County Tipperary. It is a beautiful setting for this holy site which has been revered for centuries. It is estimated that there around 3,000 holy wells in Ireland, and St Patrick’s Well is thought to be one of the largest in the country. At St Patrick’s well, legend has it that St Patrick stopped off at this valley on his journey through South Tipperary and Waterford where he reputedly converted the King of Munster to Christianity at the Rock of Cashel. St Patrick was reputed to have stopped here to bathe and baptise local people, however it is unlikely that Patrick was ever in this part of Ireland, as he does not mention travelling to the south of the country in his writings. Like many holy wells around the country, St Patrick’s Well is said to have many curative properties in local belief and folklore. It is said that by drinking the water from the well or even washing in the well, ailments like sore lips, sore eyes and many other chronic diseases can be cured. Indeed, it is thought that the well at St Patrick’s has magical properties as the water that flows through the well never freezes, this is more likely due to the well being fed by natural springs that maintain a constant temperature. 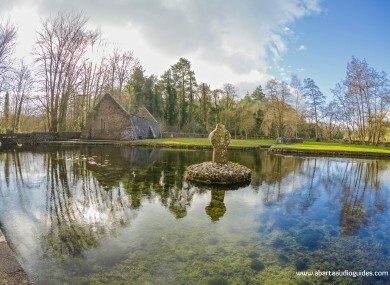 Standing on a small island in the pool at the well is a small sandstone cross, thought to be one of the oldest archaeological monuments at St Patrick’s Well. This cross is thought to date to the 8th century. It was originally positioned close to the church on marshy ground, but a programme of renovation and reconstruction was carried out at this site in the 1960s and the cross was moved to its current position. The stone church which stands to the south appears to date to the fifteenth or sixteenth century. There is a historical record of the Abbot of Inislounaght being buried at the church in 1617. Inislounaght was once a thriving bustling Cistercian Abbey but there are no traces left of the Abbey today. However, it is thought that some architectural fragments were brought from the Abbey to St Patrick’s Well and incorporated into the parish church. Within the now roofless parish church there is an altar tomb dating from 1622, dedicated to the White family. St Patrick’s Well is a great example of this type of archaeological monument that transcends the boundaries between Paganism and Christianity. If you visit this peaceful spot it is easy to see why it was chosen hundreds or even thousands of years ago as a place of worship as there is a uniquely tranquil atmosphere here. The easiest way to get to St Patrick’s Well from Clonmel is to take the left hand turn after the Poppyfields shopping centre on the Cahir Road. Follow this narrow road until you come to a crossroads, turn right and continue on this road, there will be parking spaces to your left and the well is accessed through a brightly painted gate. There are signposts leading to the site. Access to the well is down a number of steps which bring you down into the sheltered valley. If you have time, visit Marlfield lake which is close by, this is a man-made lake which is now home to a wild bird sanctuary. The site most associated with Patrick is the majestic holy mountain of Ireland that rises 765m above sea level over the beautiful surroundings of Clew Bay. According to legend in 441 AD Patrick made his way from Aghagower and journeyed on a pilgrimage to this sacred mountain. He climbed the mountain 40 days before Easter and spent forty days and 40 nights fasting and praying on the mountain. During this long solitary struggle, it is said that he was visited by demons and visions of the old pagan gods and he banished each and every one by praying and ringing a bell. Patrick resisted temptation and on the fortieth day he declared all demons to be banished from the country never to return. Legend has changed demons to snakes and to this day, Patrick is still the patron saint of ophiodiophobics. Now the mountain has become an important pilgrimage destination. Large numbers of visitors climb Croagh Patrick every year, and on ‘Reek Sunday’ (the last Sunday in July) alone, around 25,000 climb the steep slopes. They are possibly following a much earlier pilgrim route. It is thought that Croagh Patrick was often the site of important festivals at the summer solstice in prehistoric periods. For example if you look carefully at this large natural rock outcrop (above), you will see it is covered in cup and ring motifs. This is the Boheh Stone (known locally as St Patrick’s Chair) and these decorations are likely to date to the Neolithic or Bronze Age periods. The stone is in the townland of Boheh, just outside Westport, Co Mayo. In 1991 Gerry Bracken – a local historian – discovered a unique event, that when standing at the rock, the sun appears to set on the summit of Croagh Patrick and then proceeds to roll down the right-hand slope of the mountain. This event occurs only twice yearly, 18 April and 24 August. The latter is St Bartholomew’s Day, traditionally the first day of autumn and an important date for cereal production. It is also one of the dates for the Tóchar Phádraig, the pilgrimage to Croagh Patrick, and the routeway passes the Boheh Stone. It takes around three and a half hours to climb and descend Croagh Patrick, but the climb is well worth the effort for the stunning panoramic views of Clew Bay. The second of our sites in Tipperary, the Rock of Cashel is one of the most spectacular and popular heritage sites in Ireland. It is also deeply steeped in the legends surrounding St Patrick. Legend has it that St Patrick visited Cashel to meet and baptise the powerful King of Munster, Aonghus. This baptismal ceremony was a huge occasion for the kingdom as the baptism of Aonghus would have marked the end of Paganism in Munster and the beginning of Christianity. Hundreds of people were invited to the site to witness this seminal occasion. Patrick carried out the baptism but at the end of the ceremony, carried away with his own oratory, he accidentally thrust his crozier (a staff with a sharp pointed end) through the foot of King Aonghus who didn’t even flinch. Of course all the spectators started to panic thinking that if Patrick was willing to stab a King through the foot then surely worse would be in store for them! When Patrick realised what had happened, he quickly calmed the situation down and took Aonghus aside to find out why he had stayed silent. Poor Aonghus admitted that he thought that the stabbing was part of the baptismal ritual. Despite the bad start, it was the beginning of Christianity on the Rock of Cashel. Again this is likely to be embellishing of the St Patrick legend by later writers. However the Rock of Cashel is still one of Ireland’s most iconic sites, with some of the most important medieval buildings in Ireland. It is certainly a must-see if you’re in the area. Originally the Rock was the ancient seat of the Kings of Munster, including the famous Brian Boru, it later became one of the key Christian centres of medieval Ireland. The Rock of Cashel is an OPW site and regular guided tours are offered throughout the year. There is an entrance fee to the site – you can click here for more details. This is the third part in a regular series of articles on great sites to visit in Ireland. I’m hoping to visit as many sites across the country as possible. If you have any suggestions for sites in your locality please let us know by leaving a comment below or send an email to info@abartaaudioguides.com. Email “4 Irish sites to visit to get close to St Patrick mythology”. Feedback on “4 Irish sites to visit to get close to St Patrick mythology”.